With over 60 figures & symbols in Jon’s painting, Jesus is holding the Constitution while the founding fathers and other symbolic individuals from the past stand directly behind him. This is to show the belief that God & Country should be united. To the left side of the painting are the strong Americans who hold the country together while on the other side or those who are weakening it. 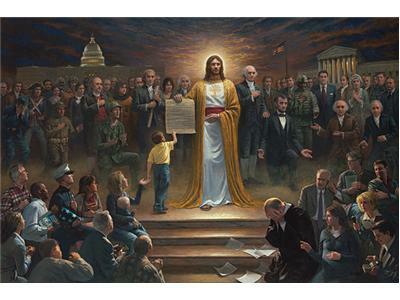 The goal of McNaughton’s One Nation Under God Painting is to awaken the government and Americans to return to the principles of freedom under the Constitution and recognize God as the source of these blessings. McNaughton is an established artist whose new paintings have attracted the international attention of millions over the last two years. This painting video has over 4 million views on YouTube alone! Highly detailed religious and patriotic subjects are the focus of his paintings. The artist’s experiences and faith are the inspiration for his work. McNaugton is also the artist behind The Forgotten Man painting. You can also get a great discount on his beautiful works by using promotional code PRDISC5.